Sometimes surreal and often sublime, Greece’s beaches form a blueprint for memorable holiday postcards. But in a country of over 2,000 islands, which beaches are best for lazy days on the sand? Perhaps the tropical reverie of Corfu? Maybe the seclusion of smaller islands like Serifos and Paros? Best for: Beach hopping and dozens of café-bars to choose from. 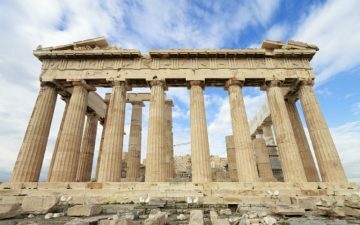 The best package holidays to Greece offer continual choice. Paleokastritsa is one destination, but it’s surrounded by six exceptional beaches. Hundreds of umbrellas provide shade on Agios Spyridon, the central beach that’s fringed by dozens of good value cafe-bars. Four secluded white sand coves are within easy water taxi reach, each of them straight from the preconceptions of tropical beach reverie. Then as your Greece holiday stretches into a second or third week, three mile long Agios Georgios North provides a halfway point between good amenities and quiet sands. 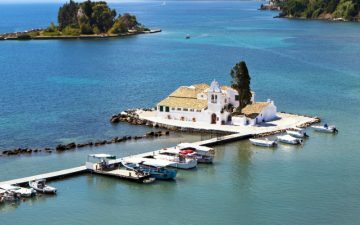 Best for: Romance and solitude on a rarely visited Greek island. White-washed seafood restaurants make for chic spots to spend the evening. Best for: Long tranquil days beneath the sun. Three miles long and virtually un-trodden, Kalathos offers a dreamy escape into the best of Greece. Like all of Rhodes’s Mediterranean facing beaches, there’s less wind here than on the northwest of the island, making the sand ideal for languid days absorbing the sun. 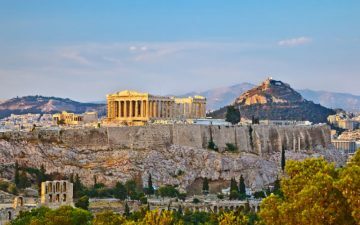 You’ll find a couple of quiet package holidays to Greece here, the coastal resorts indelibly framed by gently swaying palms. Best for: Beautiful surroundings and enviable travel photos. Deep blue waters crash down on the blinding white pebbles of Myrtos, northern Kefalonia. Tucked away between towering cliffs, Greece’s most famous beach can be accessed by regular public bus services from the harbour in Agia Efimia. Despite its popularity, Myrtos is over a mile in length and it’s easy to find beach loungers at the quieter far end of the beach. Make sure you take a photo of the beach from the cliffs. It’s the kind of image that has all your friends planning a Greece holiday. Best for: Combining culture with beaches. Greece’s great beaches aren’t just restricted to the islands. Barely an hour from Athens, a sublime succession of coves and headlands make it easy to combine beach relaxation with a trip to the Greek capital. A series of colourful seaside villages run from Glyfada to Cape Sounion, with the most evocative sands marked off as private beaches. You’ll have to pay the equivalent of around £5 to use the beach, but the charge helps ensure the sand is always blissfully empty. Lining the beaches are traditional restaurants, most of them much cheaper and more authentic than anything found on the islands. Best for: A resort break on a serene beach. Charming and inviting, Tigaki is the quieter sister of nearby Kos Town. A broad beach stretches seven miles along shallow waters, the clear sapphire ideal for those who aren’t the most confident swimmers. Tigaki is a resort town but it’s virtually devoid of traffic and noise. It’s this mix of solitude with good amenities that’s making Tigaki a popular choice for the over 50’s taking package holidays to Greece. Best for: A unique backdrop and quaint seaside village. Great beaches are a mainstay of almost every Greek island, but not all of them feature a crumbling Venetian castle as the backdrop. The fortress is literally on the sand, its weathered walls transposed straight from a medieval fairytale. 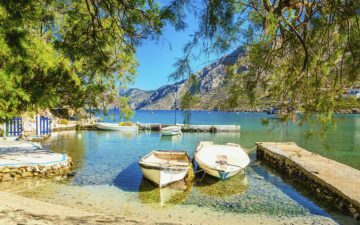 Frangokastello is easy as a day trip for anyone on a package holiday to Greece and Crete, but the tiny seaside village is also a relaxing place for a week long getaway away from the crowds. Best for: Evocative towns and a choice of beaches. Red and black aren’t the colours usually associated with a great beach. But while Santorini’s volcanic pebbles aren’t blinding, the island remains a firm Greece holiday favourite. Resplendent whitewashed houses cascade down the cliffs of its two main towns – Fira and Oia – idyllic places for soaking up the evening atmosphere of traditional Greece. 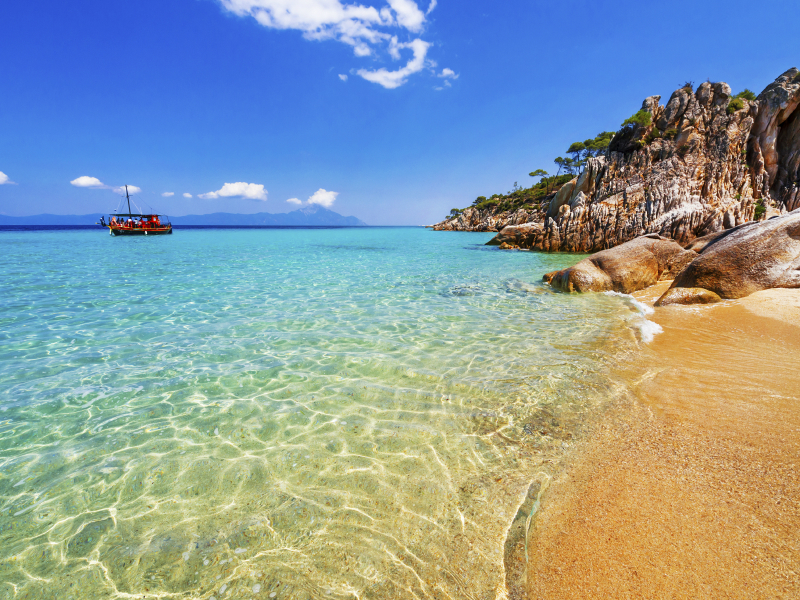 During the days, choose the unique pebbles of Red Beach, or the quiet blackened sand of Perissa Beach. Best for: A Greece holiday with the whole family. It’s impossible to have a relaxing beach holiday when you’re continually worried about the safety of the youngest members of the family. A very shallow slope and virtually non-existent waves make Ornos Beach the safest on the island of Mykonos. Curving around a charming bay, the sand is dotted with generously spaced loungers. And while it’s popular with families, the vibe is still one of relaxing and taking things slow. Best for: Turquoise waters and tropical beach reverie in low season. Separated from south western Crete by a shallow lagoon, the sublime waters of Elafonissi are amongst the most famous in the whole of Greece. Green hues flicker towards the horizon and vibrant fish swarm around your feet as you wade into the warm waters. White sand covers most of this tiny island, although it’s sometimes interrupted by swathes of minuscule pink seashells. It’s renowned beauty means Elafonissi gets busy with families in high season. For a relaxing Greece holiday, Elafonissi is best enjoyed in the low season months outside summer. Best for: Utter relaxation on a popular island full of choice. Paros is a gem of an island, combining sublime waters with trendy resorts and romantic villages of white stone. Unfortunately, many of the beaches get overly crowded with a young and sometimes boisterous crowd. That makes Ambelas even more unique. Outside July and August there’s hardly a footprint on the beach, remarkable given the popularity of the island. Ambelas feels isolated and remote, but step off the sand and you’re quickly within an area of sea facing hotels and cute restaurants. Blending long beautiful beaches with great local hospitality, redolent Naxos is quickly emerging as one of the best Greek islands for the over 50’s. A sprinkling of Roman history can be discovered, as can a series of towns that reflect in unflustered turquoise waters. Five outstanding beaches are within 30 minutes bus ride of each other, meaning there’s lot of variety for those looking to explore. St Georgios and Agios Prokopios are the most popular, but on Naxos that still means they’re endearingly relaxed. Further afield, Plaka and Mikri Vigla have stunning green backdrops that send the scents of olive groves onto the sand. While other islands throb with crowds in mid-summer, Naxos retains a sense of freedom and relaxation all year long.